From a professional mover with the Sooner Moving Company in Oklahoma, this blog is being published to help you enjoy a more stress-free, hassle-free and damage-free move. From packing tips to loading tricks, this advise comes from a team with well over 50 years experience and will help save you time and money throughout the moving process. 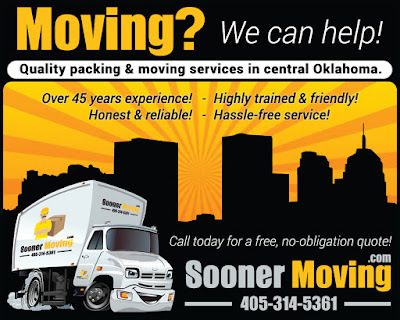 If you live in Oklahoma and are planning a move, give us a call today! We can design our services to fit your needs and budget. Let us take the load off your shoulders while giving you the time you need to focus on other important aspects of your move! Create an inventory of your possessions. If possible, consider creating an album containing photos and receipts.. This will help you in the case that anything becomes damaged or lost during your move. Contact a moving company 6 weeks prior to the big day. Submit a change of address form 2-3 weeks prior to your move. If renting, notify your landlord at least 30 days prior to returning the keys. Consider setting up a new bank account if you are moving out of town and are currently banking with a regional bank. Consider ordering new checks with your change of address in time to receive them prior to moving day. Consider gifting, donating, selling, or trashing items that are no longer needed. Slow down on grocery shopping as you approach the move, so you are not trying to transport perishable items. Eliminate any online purchases that may not arrive prior to your move. Be sure to identify what items are not allowed in your shipment. If you are unsure of how to properly dispose of these items, Sooner Moving recommends you visit earth911.com to help you find appropriate recycling centers in your area. If you have children, consider letting them have goodbye parties to say farewell to their friends and classmates. Schedule an appointment with service technicians and/or crating companies to prepare your appliances/television sets to ensure they can be moved without damage. Notify utility services two weeks prior to your move. Schedule them to turn off services at your old home the day after you move, and turn them on at your new home a couple days prior to moving in. For your families safety, you might want to call a locksmith and arrange to have door locks changed at the new home on move in day. Schedule a cleaning company to clean the new home and steam clean the carpets a couple days prior to moving in. Schedule a pest control company to treat your new home a few days prior to your arrival. Have records transferred to new schools. Research cable/satellite, internet and phone providers in the new area and set up appointments for service installation. Fill and transfer any prescriptions a week before the move. Have any vehicles traveling serviced and prepared for your journey. Return videos and/or library books. Cancel subscriptions for any home delivery items. Have each family member prepare a “move kit” consisting of everything they need for the drive and the first night or two in the new home. This would include clothing, toiletries, books, games, electronics (cell phones, iPad or laptop along with their chargers), snacks, etc. Empty lockers at clubs or gyms. Return anything borrowed from friends or neighbors. Withdraw cash for unexpected expenses during the move. Properly dispose of flammable items that cannot be transported. Unplug, clean and defrost your refrigerator/freezer one-two days before packing it in the truck. Empty gas and oil from lawn mowers, weed eaters, etc. Take a family photo in your old home before leaving. Separate out any valuables, such as cash, jewelry, important paperwork, family heirlooms, etc. and consider moving them yourself if at all possible. The professional movers at the Sooner Moving Company in Oklahoma can help save you time and stress -- alleviating you of the need to pack, load and unload so you can focus on the multitude of other things you need to get done prior to your relocation. With an excellent reputation for providing damage-free, worry-free, hassle-free moves, competitive rates and the expertise of over 45 years experience, you can count on them to get the job done right the first time - every time. For more information, call them at 405-314-5361, or visit their website at http://www.soonermoving.com.